Three weeks ago, the Kwa-Zulu Natal Sharks Board (KZNSB), pulled some of their nets along the KZN coast, replacing them with drumlines. A step designed to reduce the amount of unintentional “by-catch” in the nets, while still keeping the beaches safe. On hearing the news, social media went into a frenzy. People are uncertain whether drumlines create safer swimming environments than nets at their local beaches, while environmentalists argue that drumlines target the apex predators and any other marine animal that take the bait. With delicate matters, such as this, the main area the KZNSB seem to be failing, is a lack of community consultation and clear communication. Curious as to why the KZNSB decided to roll out the change in Shark Risk Management, Zag reached out to Greg Thompson, acting Head of Operations to get the story straight from the source. Zag: The call to replace nets with drumlines, was this due to public pressure? Or was it always on the cards? Greg Thompson: The rollout of drumlines at eThekwini beaches was always on the cards. It is a continuation of their installation on the Hibiscus Coast in 2007 and KwaDukuza (Zinkwazi-Ballito) in 2015. Drumlines must be cheaper than nets, is this the case? And if so, was that a factor in the decision to install them over nets? The implementation of mixed Gear (nets and drumlines) was never about a reduction in costs and only an environmental consideration. Please keep in mind that drumlines are not cheaper than nets. We still need the same number of boat crews/employees servicing and baiting the gear. Bait is also an added cost. Are the drumlines that are in place SMART drumlins like the ones used in Australia? Drumlines and SMART drumlines are different. The drumlines which are used in Queensland and KZN are simple fishing devices with a large baited hook suspended from a large float (originally a drum). A SMART drumline, as used in New South Wales and Reunion, is a far more sophisticated system. Whenever a shark is hooked, an alarm is activated which alerts the operator, who then proceeds to sea and can then decide whether to release the animal caught because it poses very little threat to human safety or to allow it to die. 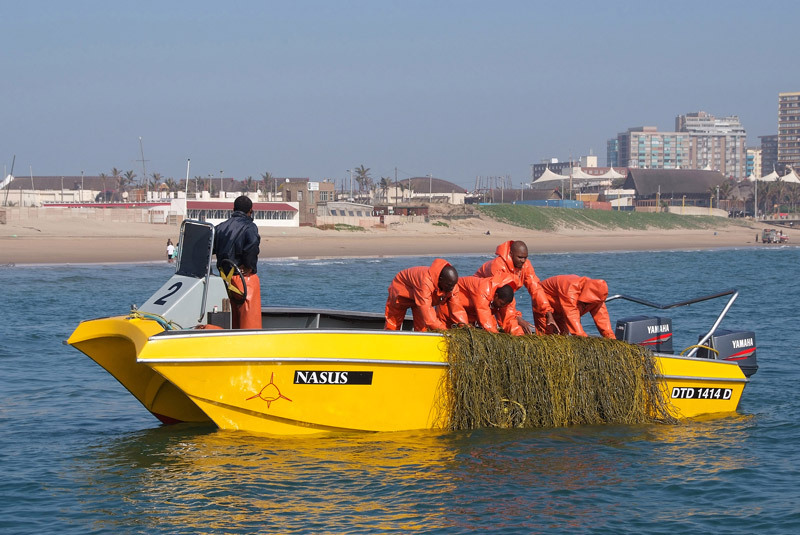 As most catches on both forms of drumlines are at night, SMART drumlines would be of little use in KZN as we only have two harbour launches which permit launching at night. Some dangerous animals are released alive from both drumlines and nets in KZN. These include the main target species: white, tiger and Zambezi sharks. This is done because we believe that the released animal will have undergone a very unpleasant experience, struggling on the end of the hook or in the net, and it will then leave the area after being hooked. In most cases, the boat crews will lead that shark offshore and away from the beach before releasing it. How often are the drumlines checked and what is used as bait? Drumlines are serviced and baited in conjunction with the servicing of nets which take place every morning from Monday to Friday and over weekends if sea conditions don’t allow us to service on Fridays. The drumlines are baited with fish species taken as bycatch in South Africa’s deepwater hake fishery. These are primarily Southern Rover / Emmelichtys Nitidus. When this is not available, Jacopever Helicolenus Dactylopterus is used. These fish are 300-500gm and one fish is used on a hook. Have the nets been completely removed? Or are they being used in conjunction with drumlines? All beaches with drumlines also have nets. Smaller beaches are generally protected by 1 net and 4 drumlines. There are no beaches which are protected with drumlines alone in KZN, as we do not yet have the scientific data to justify using only drumlines in summer when our Zambezi shark catches are highest and when the incidence of flooding rivers is also highest. Hence the reason we refer to our Shark Safety Devices as Mixed Gear. Do you think the public is at greater risk since the removal of some of the nets? Our core mandate is to protect bathers from shark-related incidents. We would not make changes to our gear, such as the introduction of drumlines if we thought the public were at greater risk. We have been using mixed gear in the Ray Nkonyeni, KwaDukuza and Umhlatuze Municipalities for many years without any shark-related incidents taking place. The last incident at a protected beach was on a surfer at Umtentweni in 1999, long before the introduction of drumlines, and prior to that at Ballito in 1980. What would happen to anyone caught tampering with the drumlines? All the local Skiboat clubs are aware that the gear is in place and it is the property of the KZNSB/Municipality. If any tampering is reported, we trust that the Commodores from the respective clubs will deal with the matter internally. What is the standard operating procedure when decisions, like the one to swap nets for drums, are made? Any changes to the gear are made after extensive deliberation among Operations management and after consultation with our senior scientific staff, who will present details of catches at the beaches under consideration. As service providers, the KZNSB then presents these changes to the respective Municipalities for their input. Talk us through what happens to sharks post-capture where they are found alive vs when found dead? When a dangerous shark is found alive on a drumline, the trace is detached from the drum and the animal is secured and slowly taken out to sea well away from any bathing area. It is then tagged and released. Exactly how many drumlines are in the water? There are now 171 drumlines in the water between Richards Bay and Port Edward. 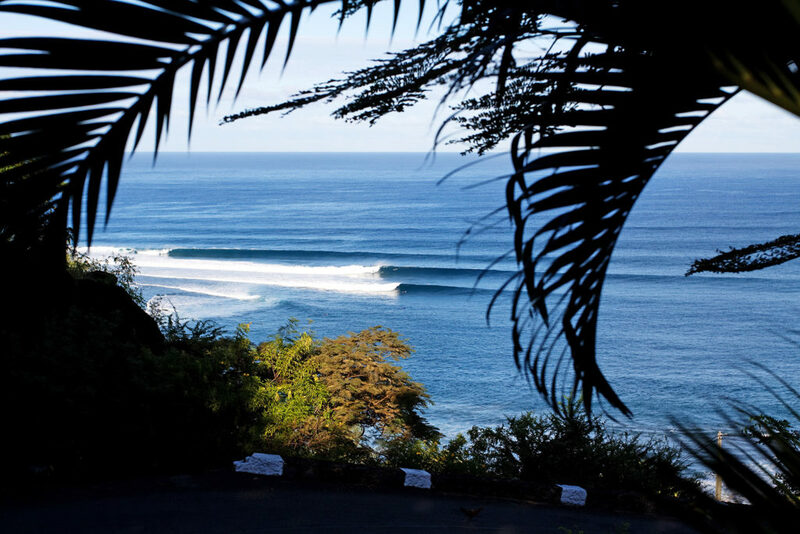 Beyond risk management what does the Sharks Board do that the public may not be aware of? The KZNSB has been actively pursuing the development of alternate methods of shark mitigation. This has involved developing an electrical shark repellent cable system, based on the well-known fact that sharks are extremely sensitive to electrical fields. We are hoping that such a cable can be deployed as a system to protect bathers at popular swimming beaches. A 100m long Shark Repellent Cable (SRC) system was tested at Glencairn Cape Town in 2015-2016 and additional tests were conducted with a shorter version of the system at Mossel Bay during 2017. Both tests yielded positive results. At Mossel Bay white sharks were repeatedly repelled by the electrical field. The KZNSB has recently contracted IMT (Institute of Maritime Technology) which is a subsidiary of ARMSCOR to design and build a Pilot Study SRC 400m long modular system. This system will be tested both locally and internationally in late 2019. Is this all necessary? Would the Sharks Board continue to operate if nets or drumlines were not in use? The reason that nets were installed in Durban in 1952 and along the rest of the coast in the early 1960s was that shark attacks at popular recreational beaches were adversely affecting coastal tourism. The KZNSB has been so effective in reducing these incidents, that people forgot that such a problem once existed. Since 1952 there has been no shark-induced fatality at any protected beach on the KZN coast and there have been only four serious injuries. Protection against shark attack is now regarded as an integral component of the tourism infrastructure of KZN. The KZNSB was formed in 1964 and was charged with the duty of approving, controlling and initiating measures for safeguarding bathers against shark attack (Natal Ordinance No 10 of 1964). It has taken over the installation and maintenance of all shark safety gear in KZN. The KZNSB’s core function is bather protection. If the politicians decided to abolish all nets and drumlines, the KZNSB would, in all likelihood, close down. 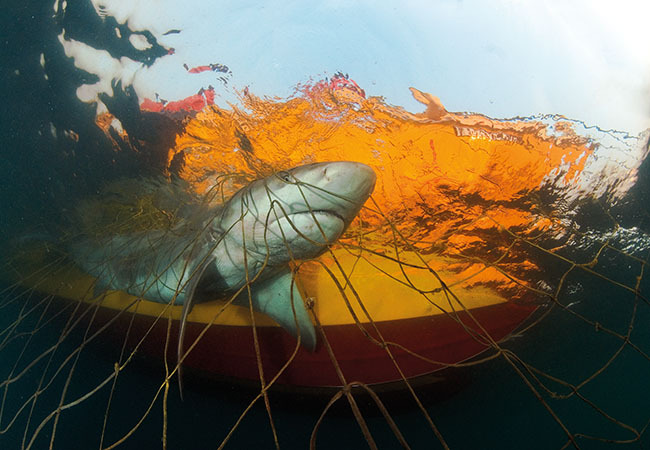 When looking into the historical shark attack data made available, the use of traditional drum lines and shark nets do markedly reduce the incidence of a shark attack when implemented on a regular and consistent basis, although this comes at a cost to marine life. Drumlines are probably less indiscriminate than shark nets which entangle smaller harmless sharks and fish as well as dolphins, seals, whales and turtles. Meanwhile, other cruelty-free management systems are being developed, such as helicopter patrols, broadcasting Orca sounds underwater, electronic deterrents, drones, the Eco Shark Barrier and even smartphone applications which use social media to advise the community of where sharks are spotted. Ultimately it would be better for our marine environment if the whole South African coastline had effective, non-lethal solutions such as Shark Spotters and exclusion barriers. Reducing nets and employing drumlines is a progressive move from the Sharks Board in trying to reduce the environmental impacts of the system they have in place. So long as the program achieves its primary goal of protecting bathers (and yes, surfers) from sharks. As seen in Reunion, a consistent spate of shark attacks is not just radically detrimental to tourism but also to the ocean-based lifestyles that literally, give our lives meaning and deliver so much happiness and enjoyment. Not to mention the many industries and economies that thrive around them. The Sharks Board should be incredibly proud of the fact that there have been no shark attack fatalities in KZN since 1952, but that has happened at the expense of a huge number of increasingly endangered sea creatures. Now the goal has to be maintaining that record while killing far fewer of them. Zag says, it’s a long way from perfect, but this is a good step in the right direction. To top it, we protect ocean users by placing a baited hook on a drum line for predators to attach themselves to? Are we supposed to assume no other larger predator won’t predate on the hooked shark or attract others? I fish offshore regularly and can’t help be boggled by this line of thinking. What is the scientific basis, if any for drum lines? The interview gives no clear evidence of any. I can’t help feeling cynical about the whole premise of what the nets and drum lines are supposed to be doing, much of it seemingly based on archaic thinking that is based on ‘protecting tourism’. Using Reunion as an example doesn’t wash.